Manuel Aníbal da Costa Monterroso was born in 1875 in the house of the Monterroso family, a distinguished family of doctors and property owners in Amarante, in the parish of Lomba, Amarante. 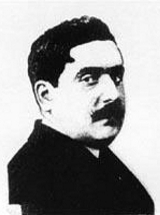 He was the son of António José da Costa and Libânia de Vasconcelos Monterroso. He showed an incredible talent for caricatures from the early age of five, when he portrayed an astonishing caricature of his cousin. He continued to draw caricatures on sheets of paper and books at Lomba School, where he completed his primary studies. He continued his studies in Porto, at the "Vasconcelos" College, in Santa Catarina Street, and was a fellow colleague of the future Earl of Castro Sola and the Viscount of Vila Moura e Ermidas. In 1897, he followed the family tradition and enrolled in the Porto Medical-Surgical School, a course which he concluded in 1902. Here, among others, he was taught by Roberto Frias, Azevedo Maia, Maximiano Lemos, Ferreira da Silva, Cândido de Pinho and João Lebre. The latter was to greatly influence the way Manuel Monterroso mastered Anatomy, in both graphical and theoretical terms. He was a fellow colleague of Campos Monteiro, Armando Chaves, Carteado Mena, Vitorino de Magalhães, Eduardo de Oliveira, Guilherme Prata, José de Sousa Lamy, among others. At the end of the course, in 1902, he presented his thesis entitled "Tuberculosis and the sanatorium". He participated in the decoration works for the farewell party of the 5th year students, and co-wrote, in verse, the lyrics to the play "Os Filhos de Minerva" [The Sons of Minerva], divided into prologue and four acts: A revolta do Olimpo, O jantar dos quintanistas, A última serenata and No regresso, staged at the Royal Theatre of S. João on 14 May. He started his medical career as soon as he completed his course, and was admitted to the Anti-Tuberculosis Dispensary in Porto, where he provided assistance to the National Assistance for Tuberculosis Patients, and was nominated Deputy Health Delegate of Porto and later became the Delegate. As a doctor, he fought against typhus fever, together with Ricardo Jorge, and against the Flu pandemic. During World War I, he practiced Medicine as a Major. He was a member of the commission that set up the roots of the Legal Medicine Institute, where he later worked as Coroner. He worked as a specialty doctor for the Portuguese Railways and wrote "A Salubridade Habitacional no Porto (1929-1933)" [Health Conditions in Housing in Porto], in 1934. A doctor and an artist, he published creative and humorist works in several Portuguese and foreign periodicals: "Os Pontos", "A Paródia", "A Brasileira", for which he designed the heading, "O Vira", "Arte", "O Povo", "Limia", "Comércio", "A Pátria", "A Luz", "O Petardo", "O Tripeiro", "O Primeiro de Janeiro", "Faro de Vigo", "Le Barbare" and "Le Rire", in France. He was engaged in other activities, such as the organization of the Carnival parade of the Clube dos Girondinos (1906), the exhibition-fair to raise funds for the premises of the Porto Society for Fine Arts (1907), the edition of n album of "illustrated cards" (1912), the participation in "Álbum de Desenhos", a drawings album to raise funds for the Shelter for the Poor in Porto, and the participation in the "Folheto de Cordel – Legendário de Quimeras do Quintanista Pedro Veiga". Manuel Monterroso also illustrated several books by authors such as Guedes de Oliveira, António de Lemos, Sarmento Beja, Raul Tamagnini, José de Castro and Arnaldo Leite. Some of his friends were humorists such as Sebastião Sanhudo, Almeida e Silva, Manuel Gustavo Bordalo Pinheiro, Celso Hermínio, Armando de Basto, Francisco Teixeira, Jorge Colaço, Jorge Cid, Francisco Valença, Arnaldo Ressano Garcia, Leal da Câmara, the Spanish Ramon Cilla (father and son), the French Maurice Neuman, and Rafael Bordalo Pinheiro, who considered him one of his favourite students, on a par with his son Manuel Gustavo. He also socialized with artists such as António Carneiro, Acácio Lino and Amadeo de Souza-Cardoso, from his home town, and Joaquim Lopes, as well as other individualities such as João Chagas, Alexandre Braga and Sampaio Bruno. He belonged to the group entitled "Fantasistas", was an honorary member of the new "Group of Portuguese Humorists" (1935) and collaborated in the short-lived newspaper "O Miau", organized by Leal da Câmara. He often offered and exchanged artistic works, which he collected. Influenced by Rafael Bordalo Pinheiro, he moulded ceramic works, such as vases. Between the 40's and the 60's, he participated in several exhibitions at the National Society for Fine Arts; at the 4th Provincial Salon, in 1956; at the Festival Salon of the Porto Coliseum, where, in 1960, he exhibited his drawings and ceramic work (an exhibition which was to be repeated in Lisbon, at the SNBA, in 1961); and at the Exhibition on Artist Doctors, for the commemorations of the 25th anniversary of the inauguration of the Medical Association, in Porto, Coimbra and Lisbon. Manuel Monterroso also intervened in several charity causes and joined exhibition and public tributes committees: the Exhibition of Portuguese Artists, in 1935, with works offered to a National Art Raffle to raise funds for the erection of monuments to Silva Porto, Henrique Pousão and Artur Loureiro; the organization of the Exhibition on Paintings by Alberto Ayres de Gouveia, at SNBA, in 1941; the "Livro de Ouro – Homenagem a Acácio Lino" [a tribute to Acácio Lino], in 1942; the retrospective exhibition and tribute to the painter Júlio Ramos, in 1943; the 100th anniversary on the birth of Rafael Bordalo Pinheiro and the posthumous exhibition on Amarelhe, in 1946; the exhibition in honour of Leal da Câmara, at the Ateneu Comercial do Porto, in 1951. His academic curriculum includes a spell as Artistic Anatomy teacher at the Porto School of Fine Arts. He retired after several decades of working as a public doctor, but he continued to practice in the private sector. He received the title of Knight of the Military Order of Santiago and the Honour Medal from the Clube Fenianos Portuenses, the Copper Medal from the Shipwrecked Rescue Institute and the Silver Medal from the Red Cross. In 1968, four years after the death of his wife, Glória Ribeiro da Silva Monterroso, this great scientist, humanist and artist died at his Matosinhos house, on 28 February. His estate, consisting of paintings on canvas, drawings, glazed tiles, furniture, ceramics and books, was donated to the Amarante City Hall, according to his final wishes.